This is a pop up CD packaging using a well know pop up beak design, this is one of the most basic pop up card design there is. However it is not originally my design however this is an interesting design. 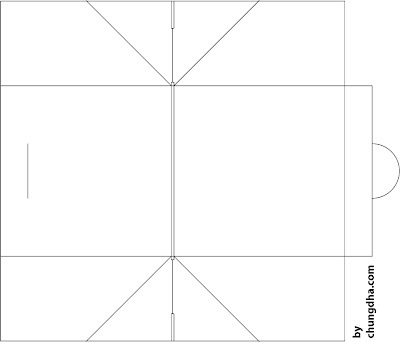 Here below is the template of it that you can make one yourself. This packaging is way better then the Pochup which could never stay flat unless you put it between a telephone book. Click the image to get the 100% size version and download it. The picture is 72 dpi so be sure to print is at that size. Here below is the PDF uploaded to Scribd and you can click on the image or link below and view the PDF and download it. If you like to support me so I can produce more free packaging templates, please donate any amount through PayPal by clicking the button below. Can I get an instruction of how to make one, and a PDF file please? Thanks. i need instruction of how to make, can i take a copy of document ? Fantastic! You're creativity never ceases to amaze me Chung Dha! Keep up the good work! I'd like a pdf file, too. I'm afraid I haven't been able to figure out how to get the mac to print the jpeg at normal size. I'd just like to try it at home for some of my cd collection. Looks like fun, and those jewel cases are really awful. Very cool stuff. Can I get the instructions ? Wow, this is amazing! I admit, I'm lost without instructions. Can you pass them my way or post them? This is really cool, but I can't read the template. Can you send me instructions? What if you open it like a book in a standing position? Is the packaging tight enough to hold the CD in its place? love it, 3D object packaged in 2D... can i get a copy of the instructions? Is it on a3 or a4?